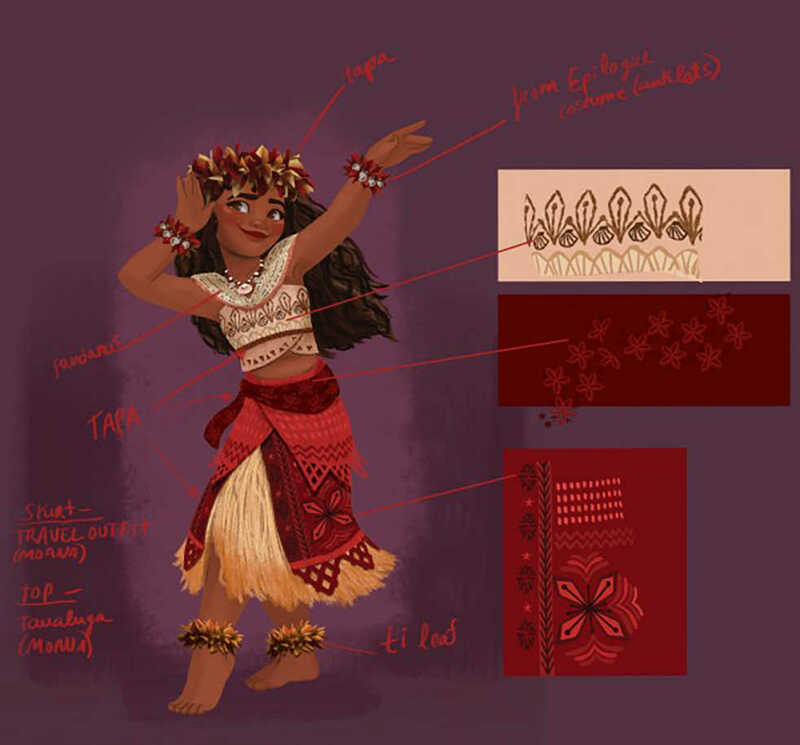 While Moana is Bové’s first foray into costume design for film, it is neither her first work with Disney nor her first time designing fashion. Though the film is a work of fiction, much of the mythos in the storyline is drawn from real Pacific Island legends. Therefore, it is critical to the filmmakers that respects be paid to historical accuracy, even down to costuming. To assist Bové with her job, the Pacific Trust sent representatives to Disney with authentic textile samples that would have been present in ancient Polynesia. Two major materials, tapa and pandanus, are the basis for most costumes in the film. The character design of Moana herself received much attention following her unveiling, with many praising her more realistic and athletic build as compared to past Disney heroines. Though functional at first, Moana’s ensembles are also aesthetically appealing. The bodice of her “traveler’s outfit,” or the burnt-orange top with the slitted skirt, is embellished with snail shells. Seen for mere seconds of the film, a more formal look emphasizes red — a color signifying regality and royalty in the Pacific islands — and features ornate embroidery and handcrafted accessories. Disney began marketing “Moana” merchandise several months ago, including Halloween costumes that proved quite popular without the film even having been released yet. Though not explicitly part of her job, Bové considered how her work would translate to the real world as well. “When I’m designing something there’s a lot of considerations: is this authentic to the character and their personality … [And] would little girls want to wear this? How would this look on someone who’s not the character? I think [girls dressing as Moana for Halloween already] is so incredible,” Bové said. To save her island, Moana teams up with the macho demigod, Maui. Though legendary for his heroism and shape-shifting, Maui’s luck has taken a turn by the time Moana meets him. Students at the presentation also viewed basic animations of some supporting characters, Pu’a the pig and Hei Hei the rooster, as well as for Moana’s father. These animations, called calisthenics tests, aim to demonstrate the range of motion of a character’s model before scenes are worked on. For Pu’a, the clip demonstrated how a scratch from his back hoof would ruffle shoulder fur. Bové went on to describe a program called Quicksilver, which was developed for “Moana” with an unprecedented purpose in mind: creating more realistic human hair, with enough weight and fine detail that a character’s fingers can run through it. “Moana” will be released nationally on Nov. 23 and features the voice talents of newcomer Auli’i Cravalho and Dwayne “The Rock” Johnson (“Fast & Furious 6”), direction by Ron Clements (“The Little Mermaid”) and John Musker (“The Little Mermaid”) and music by Opetaia Foa’i, Mark Macina (“The Lion King”) and Lin-Manuel Miranda (“In the Heights”).